Welcome to HEARTS! In this section, we will feature stories of the different hearts that beats in Hope Centre (Singapore). 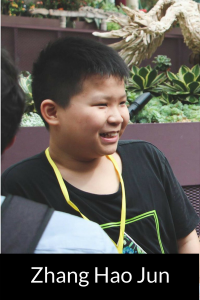 Today, we have the story of Zhang Hao Jun, one of our beneficiaries in our Youth programmes. Endearing, Cheeky and Helpful are the words our volunteers will usually use to describe Hao Jun now. Over the 2 years that he has been with us, Hao Jun has improved tremendously. In the beginning, the only language he knew was Mandarin. Therefore in school, he was unable to understand or communicate with his peers and teachers. At home, his parents placed additional pressure on him to do well and would discipline him physically if he did not. As a result, he was unable to regulate his emotions and would regularly lash out in anger on himself and the people around him. This is especially so when he was forced to do any form of English homework. Together with our volunteers and partners (his school counsellor and social workers from Kampong Kapor FSC), we intentionally connected with Hao Jun, building trust and rapport over time. Slowly, he opened his heart to us, and allowed us to help him through his fears and struggles. 2 years on, Hao Jun is now a bubbly boy who actively uses English to express himself and to communicate with his peers and teachers. He jokes around using English too! Also, he does his homework with zeal and is working hard towards his goal of passing all of his subjects this year! We look forward to watching him grow and reach the goals he has set out to achieve and beyond!